These multi-channel peristaltic pumps are positive displacement pumps that accurately produce synchronized flows of any liquid without valves, seals, or pistons. 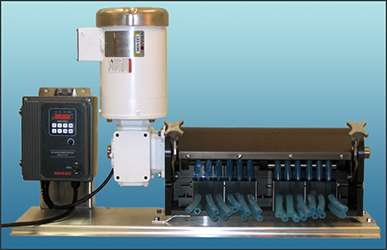 Reliable and durable, AccuStaltic pumps simply squeeze the liquid out of a flexible peristaltic tube using precision rollers in a continuous or cyclic rotary motion. This way, the fluid only contacts the inside of the resilient peristaltic tubing. AccuStaltic pumps are specifically designed to utilize multiple tubes simultaneously. Our multi-channel peristaltic pumps are available in models with 4 to 12 individual flow channels. These channels can be combined with different manifolds and tubing to create multiple flows from a single continuous flow at up to 180 liters per minute. Pump liquid to 12 accurately metered individual flows of as little as 1/2 ml per cycle. AccuStaltic pumps are self-priming, non-cavitating, and can be run dry without causing damage. Review the benefits of an AccuStaltic multi-channel peristaltic pump to see how it compares to the competition.